There is little doubt that high fidelity addicts, especially, will relish this newest offering of Arthur Ferrante and Louis Teicher, as they have all the duo’s previous albums. With their explorations into new vistas of sound and new stereophonic theories, the result is an altogether unique application of typical F. & T. experimentations, brought to the fullest measure of appreciation for you. For instance, have you ever wondered about the limitations of the eighty-eight assigned tones of the piano keyboard, and contemplated on the possibility of expanding the range an octave or so? Or two octaves—one to stretch an octave higher than the present top, and another eight sonic tones to range an octave lower than the present low? Cease your wondering, gentle music-lover… for Ferrante and Teicher have gone far beyond this aural panorama, extending (by means of their engineering ingenuity) the range of the keyboard by another four octaves—two octaves above and two octaves below the present range. With your musical appetite thus awakened, we should take note of those who may be brand-new Ferrante and Teicher initiates and advise them that every sound heard in any F. & T. collection is made with naught save the piano—with but a few assists from the celeste in this set. No special piano, either, but (two) standard Concert D Steinways. To be quote factual about it, however, the assorted pianistics of these two pioneers of sound are the results of years of painstaking research and a consuming curiosity to explore the hidden realms of the pianoforte. Having met at the famed Juilliard School of Music when each was but six years of age (! ), Arthur Ferrante and Louis Teicher have long been in the vanguard of stalwart classical artisans who have bridged the not-so-wide gap to what is loosely termed “popular” music. According to them, the line of demarcation is so slight as to be almost indiscernible, since “pop” music is representative of the great American contribution to the art. No theoretical “longhair” snobs, these two! Their teaching duties at Juilliard also offered the team the opportunity to begin enlarging their already-extensive two-piano repertoire. They had done much in the matter of studying just about everything that had been written for duo-piano work, and had also experimented in the arrangements for the unusual styling which their subsequent teamwork has since developed so markedly well. It wasn’t until they had begun working on Ravel’s Bolero, however, that they suddenly devised their first new sound. Seeking a surcease from the repeated G on the piano, the team hunted desperately for a sound which would closely resemble the unsnared drum sound as employed in the orchestral version. The result was their answer to the violin mute, a rubber wedge, which fit their purpose perfectly. From that first devisation, Ferrante and Teicher went on to greater experimentation, research and invention, until their startling innovations have become wholly identifiable as The Ferrante and Teicher Sound. They still continue their experiments, of course, and the team finds itself constantly bemused and amazed by the multitude of new sounds which they have coaxed from the piano—all parts of it—and have succeeded in passing far beyond the sound barriers which the instrument offered heretofore. With this newest batch of sonic skill and perfection of performance, you are certain to gain a new insight and novel appreciation of the piano. Aside from the vivid Ferrante and Teicher interpretations, you will experience moments of sheer, unbounded delight at one time, then gasp in awe in the next moment to realize that the sounds you do emanate from a piano—or, specifically, two pianos (and that smattering of a celeste). Here, then, are FERRANTE and TEICHER, musicians to the nth degree, scientists of a sort, virtuosi without peers. In this rocket age, the missile era, the atomic period, it seems only fitting that music should be represented by an epochal compilation of its own. 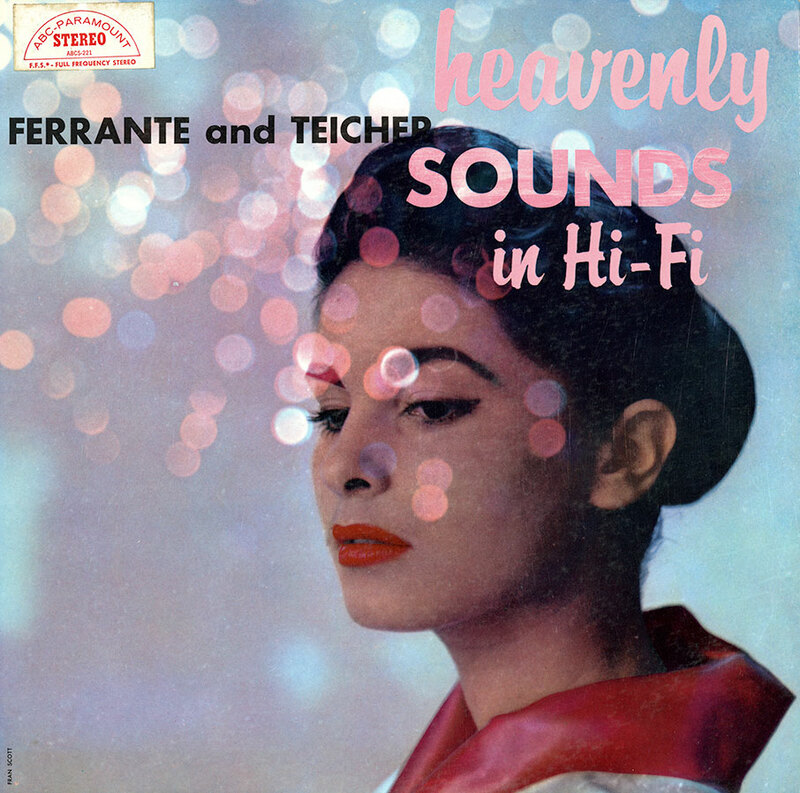 To that end, we humbly present this group by Ferrante and Teicher—their HEAVENLY SOUNDS IN HI-FI. This recording was made on an Ampex Magnetic Tape Recorder Model 300 using RCA, Telefunken and AKG microphones, balanced through a specially designed 16 input Stereophonic console with a signal to noise ratio of over 80 decibels. The tapes were mastered at Olmsted Sound Studios in New York on a Scully Recording Lathe with a Westrex 3A Stereo Disk Feedback Cutter Head driven by 2 specially designed Whittier Stereo Cutting Amplifiers with a 250 watt peak capacity in either channel. RIAA EQUALIZATION CURVE: Crossover, 500 cps; Rolloff, 13.75 db at 10 KC; Low Freq. Capabilities, 20 cps; High Freq. Capabilities, over 20kc. RIAA Playback equalization should be used for this record in order that the ultimate performance capabilities may be realized. It is not recommended for playback with standard monaural phonographs, unless equipped with a compatible cartridge. The final band on side two of this recording contains a test tone. This has been included as a convenience for balancing your speakers. When the tone appears to be coming from the center area, rather than from either speaker, then your set is in proper balance.